In all of my travels across the country to various art shows, I spend most of my time educating people about the important differences between natural, "gem quality" turquoise versus stabilized turquoise. Many of the imitations on the market are hard to distinguish just by looking at it. with the exception of some stones like Howlite that have been dyed a turquoise color and are marketed as turquoise. To learn more about the differences, read on. The price of Turquoise is often associated with it's rarity. For example, only slightly over 800lbs of the Blue Moon Turquoise I use in the Turquoise Legacy Collection has been removed from the mine to date, making Blue Moon Turquoise rarer than some of the other mines such as Royston, Kingman or Sleeping Beauty Turquoise. From all of the miners I know personally, it's estimated that over 90-95% of the turquoise on the market today has been stabilized or enhanced. This is important to know when buying turquoise jewelry of any kind. For this reason, I offer a signed certificate of authenticity with each purchase. Turquoise Chalk can't be cut into gemstones without stabilization because it is far too soft. This super low grade turquoise is often sold very cheaply by the pound to processors who stabilize or enhance it to improve the color and density. Stabilized turquoise is costs much less than natural turquoise and can be produced in large quantities..
With stabilized and enhanced turquoise, epoxies are added via pressure to the low grade turquoise chalk infusing it with plastic. Some stabilized turquoise is also color enhanced depending on the color and quality of the turquoise chalk. Reconstituted Turquoise: Is created when fragments of turquoise are crushed into powder and mixed with epoxy. Mohave Purple Turquoise is one example of reconstituted turquoise. It is dyed and reconstituted. Imitation Or Block Turquoise: Dyed Plastic materials or other stones such as Howlite – which is white with black veining are dyed and marketed as Turquoise but they are imitation and are the cheapest on the market. Ask For Full Disclosure And Pay Attention To Prices When Purchasing Turquoise Jewelry. Because Stabilized Turquoise is less expensive than Natural Turquoise, jewelry should be priced accordingly, and the source/quality of the turquoise should be disclosed. Many people don't pay attention, or are not knowledgable about the quality of stones they buy when buying jewelry from artists and manufactures for resale. That said, I would always asked for full disclosure about the turquoise your buying. If they only tell you the name of the mine it's from, there's a larger chance that it may be stabilized turquoise unless they back it up with paperwork or a Certificate Of Authenticity. Buying Turquoise Jewelry from a reputable and informed artist or business is the safest bet when buying turquoise jewelry as there is a lot of dishonesty in the marketplace (as I well know) concerning the quality or condition (ie: stabilized, enhanced, dyed) Stabilized Turquoise is NOT considered a fake stone, and is preferred by some people due to the fact that it's encapsulated in plastic and the color is locked in unlike natural turquoise whose color can deepen and change over time. Stabilization methods have improved greatly over the years making it difficult for many experts to tell the difference. 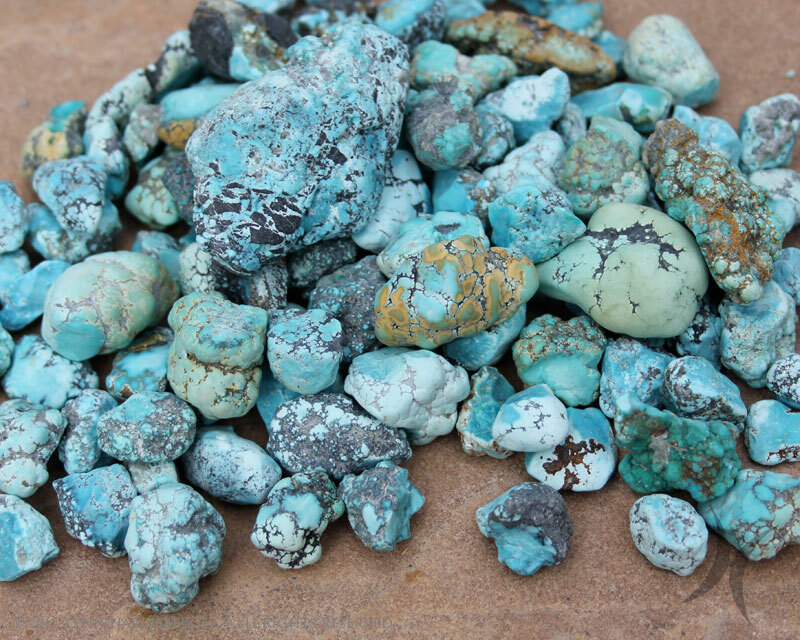 I have bought a lot of turquoise rough from dealers in the past who sold it to me as natural turquoise. It looked natural slabbed with no residue showing, but as soon as I started cuting it I smelled the aroma of burnt plastic rising from the wheels and I knew it was stabilized. Just like diamonds (Turquoise is considered to be rarer than diamonds) Natural Turquoise is sold by the carat weight. The price per carat will depend on the rarity as I mentioned above. The larger the stone, or the more stones there are in a piece of jewelry – the higher the carat weight – and the higher the price of each piece of jewelry. The demand for Turquoise soared as did the price - increasing as much as 100% for high quality natural rough. See The American Turquoise Mine map indicating all of the closed mines in America. See The Turqoise Legacy Collection featuring rare, natural Blue Moon Turquoise from Nevada. This is the very family who honored me with the opportunity to mine the Turquoise I use in my work.